You can add referral sources to your organization's database. Referral sources are sources, other than patients, that have referred patients to your office. Note: Referral sources are global (available to all locations across your organization). On the Settings menu, under Patient Care, click (or tap) Referral Sources. The Referral Sources page opens. On the Referral Sources page, click (or tap) Create New. 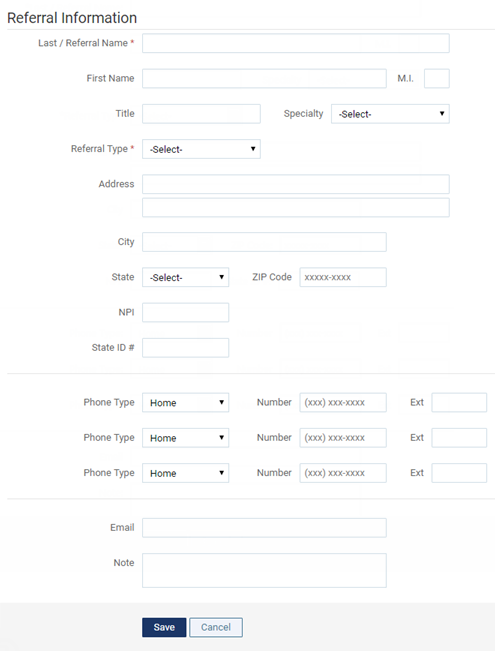 The options for entering referral information become available. Enter a name, and set up the other options as needed. Name - The source's first and last name and middle initial, or the referral name for a non-person referral source (for example, "Yellow Pages"). Title - For a referral source that is a person, the source's title (for example, Dr., Mr., or Ms.). Specialty - For a dental professional, the source's specialty. Referral Type - The type of referral: professional, marketing, or other. Address - The source's address. IDs - For a dental professional, the source's NPI and State ID #. Phone Numbers - The source can have up to three phone numbers and corresponding extensions (where applicable). Make sure the correct Phone Types for each phone number is selected: home, work, mobile, or other. Email - The source's email address. Note - A note regarding the referral source. Allow linking of referral to groups. Such as Best Ever Oral Surgeons might have five individual doctors. Allow inactivation of referral sources. For instance, an oral surgeon might retire, no need to keep searching past her name.